The Samsung Gear S smart watch has an elegant curved Super AMOLED display for a comfortable fit. Express your style with changeable straps and screen clocks. See info and alerts on a beautiful, easy-to-use interface. 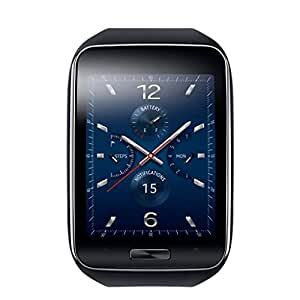 With 3G, Wi-Fi and Bluetooth, the Samsung Gear S lets you make / receive calls and messages even without your phone. The on-screen keyboard supports up to 69 languages. Be active and productive on the go with useful Gear S features and apps. Get step-by-step walking directions, use enhanced S Voice to do things hands-free, enjoy 24-hour news and stay fit with S Health. The Samsung Gear S is your perfect health and fitness companion, with enhanced multi-sensors, built-in GPS and powerful S Health features. It can support and coach you while you exercise and help to keep you motivated. The Samsung Gear S lets you enjoy real freedom by delivering a smart mobile experience without a smartphone in hand.